With their introduction of the Bermuda 30 into the United States in 1963, Cheoy Lee spawned an era of Asian-built yacht imports, but they were, by no means, new to the business. Cheoy Lee Shipyards Ltd. was founded in Shanghai over 100 years ago. Following World War II, the company moved to Hong Kong, and in the early 1960s, it was one of the first Asian companies to begin production of fiberglass yachts. In the past 40 years, Cheoy Lee has become one of the most prolific boat builders in the world, offering nearly every conceivable size and style of boat, power and sail alike. In 1982 Cheoy Lee made a departure from the company’s "Offshore" and "Clipper" series of traditional, heavy displacement sailing yachts with the introduction of the Pedrick 41. The designer Dave Pedrick had established a reputation for his successful 12 Meter and IOR design work, and the Pedrick 41 is definitely a more performance-oriented cruiser than the company’s previous models. The design features rather high freeboard and a low profile, wedge-shaped cabin trunk. Standing next to her at the dock she appears a little chunky, but stand back a bit and the gentle sheer and well balanced overhangs stand out. I think this is a very handsome yacht. The length overall is 40’10", beam is 12’8", and displacement is 23,000 lbs. The Pedrick 41 was offered as a deep keel model, drawing 6’ or a keel/centerboard version drawing 4’ 4" with the board up and 9’ with the board fully extended. Ballast to displacement ratio is 39%, and the displacement length ratio is 299. Both are quite conservative and normal numbers for this class of boat. The construction of the Pedrick 41 is typical of Asian-built boats. The hulls are solidly constructed of fiberglass cloths and polyester resin while decks and superstructures are a composite of fiberglass laminates and core materials. Just what is used for the core material seems dependent on what’s at hand at any given time. Consistency and quality control have never been the strong suit of many Asian builders. I have seen a section of the cabin top cut from a Pedrick 41 that, in its several square feet, contained teak scraps, plywood and balsa wood core material. To make things worse, decks are covered with a teak overlay, which is screwed to the sub deck creating thousands of potential leaks. In fact, decks and superstructure are the most common sources of problems with this model. As these boats age, failed caulking and fasteners allow water to penetrate into the core of the sub deck creating a potentially expensive repair. Leaks around cabin windows and deck hatches are common, and if left unattended, will lead to considerable damage of interior furnishings and joiner work. With the exception of osmotic blisters, which are fairly common, there are few problems with hull construction. Another potential problem lies in Cheoy Lee’s selection of cast stainless steel for all of its underwater appendages and running gear. There are many different grades of stainless steel, but one thing they all have in common is their dependence on oxygen in order to form chromium-oxide. In a chloride-rich, oxygen-starved environment (i.e. salt water) pitting begins. Over time, pitting has a tendency to penetrate deep into the part eventually leading to structural failure. Struts, centerboards and propellers that are over ten years old should be thoroughly examined for signs of failure. The accommodations of the Pedrick 41 are, for my taste, near perfect for this size boat. The layout is centered around a large main saloon with settees on each side and a drop-leaf, centerline table. There is a large V-Berth cabin forward and a comfortably sized double quarter berth cabin aft along the starboard side. The large starboard midship head has a separate stall shower. The U-shaped midship galley along the port side is actually large enough to prepare a meal and secure enough to do it underway. The navigation station to the port side of the companionway faces aft and allows the navigator to communicate easily with the helmsman. There is only one little drawback to this layout, which is, with the table fully extended, it is impossible to get to the forward cabin without crawling over the settee, but this is really nit-picking. The standard engine on the 41 was the Perkins model 4-108 diesel. This solid engine has plenty of power, and if properly maintained, should run for thousands of hours. The engine is fitted with a V-drive gear that allows the engine to be installed further aft under the cockpit. This has the disadvantage of moving the engine weight further away from the boat’s center and making service of the shaft packing gland more difficult, but with a cruising boat, the advantage of increased cabin space clearly offsets the disadvantage. 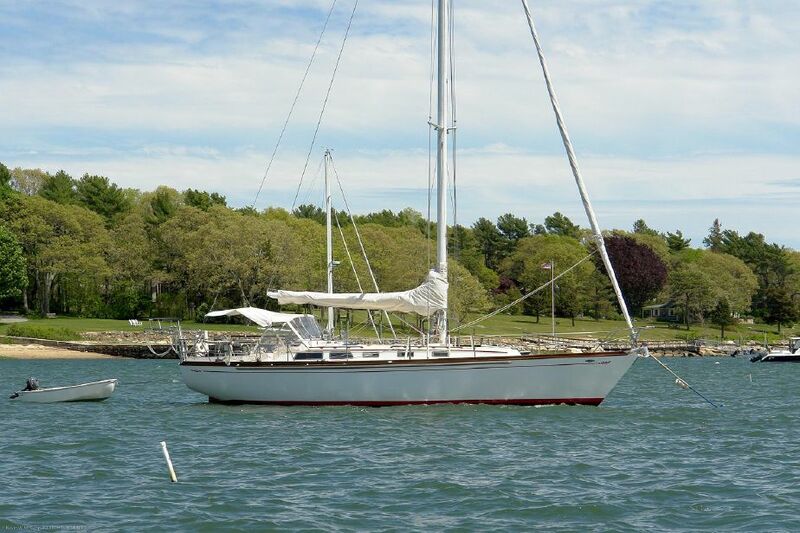 The standard rig of the Pedrick-41 has a mast height above deck of 53’, although a 50’ rig was offered and is recommended on the centerboard model. Dave Pedrick is noted for designing boats that perform well, and the 41 is no exception. With a sail area displacement ratio of 15.56, the 41 won’t take off like the proverbial scared rabbit when the wind picks up, but this is a well mannered boat with no particular bad habits. The centerboard version will suffer a bit to windward when compared to the deep keel model. The Pedrick-41 is a very livable boat that sails well. With an experienced crew and properly maintained this should be a capable blue water cruiser. For these reasons, this remains a popular choice of cruising sailors, although production ended in 1994.